Please note the re-posting of this article for information purposes does not constitute endorsement of its politics by the Red Phoenix or its editorial staff. On the 14th anniversary of his rescue from a raft in waters off Fort Lauderdale, Elián González said he blames the Cuban Adjustment Act for his mother’s death and the international custody battle it sparked on his behalf. In the interview in Spanish, he said his basic rights as a child — “the right to be with my father, the right to maintain my nationality and remain in my cultural context” — were violated in the United States. On Thanksgiving weekend 1999, the little boy was rescued by two Broward County fisherman. He was the youngest survivor after an overcrowded boat capsized en route from Cuba to Miami. His mother and 10 others seeking to enter the U. S. drowned at sea. His Miami relatives fought to keep him in the U.S., saying that had been his mother’s wish. But his father in Cuba — and Fidel Castro — demanded he be returned. 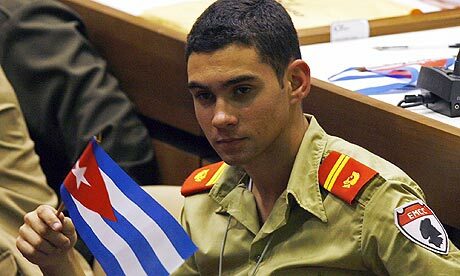 The Elián González saga culminated in a pre-dawn raid on April 22, 2000, when heavily-armed U.S. agents broke into the Miami home of González’s uncle on orders of then-Attorney-General Janet Reno with the ultimate goal of returning the boy to Cuba. “Those days were very sad for me, which marked me for life,” González said Monday. “It never gave me the chance to think of my mother, who died at sea as a result of the Cuban Adjustment Act,” he said, referring to the 1966 U.S. law that allows any Cuban who reaches the U. S. by any means to be paroled and given residency. The boy’s return to Cuba was a huge boon to then-leader Fidel Castro and a bitter letdown for many in Miami’s Cuban exile community.